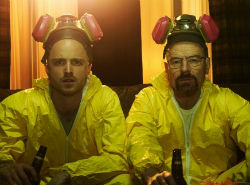 The season finale of Breaking Bad has resulted in a record number of pirated downloads for the popular TV-series. Just 12 hours after the first copy appeared online more than 500,000 people had already downloaded the show via various torrent sites. Most downloaders come from Australia, followed by the United States and the UK, where thousands of file-sharers prefer unauthorized copies over legal alternatives.